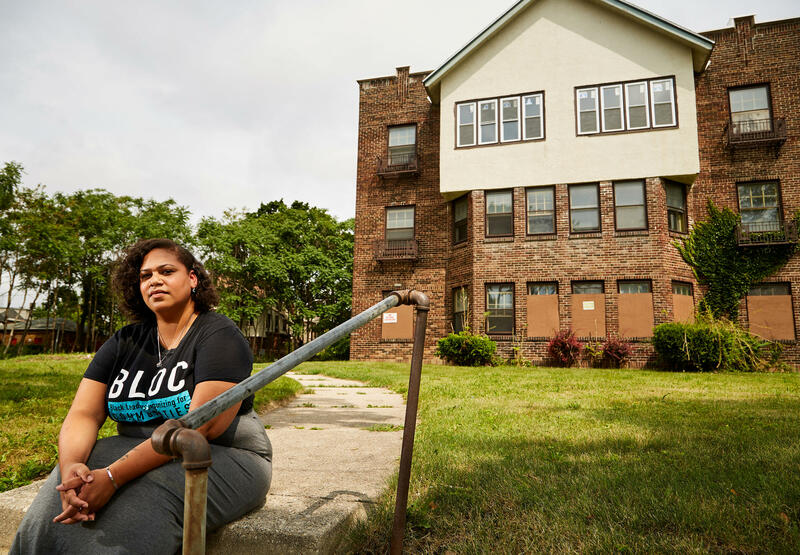 Angela Lang, executive director of BLOC, Black Leaders Organizing for Communities sits for a portrait in front of her childhood home Aug. 7, 2018 Milwaukee. 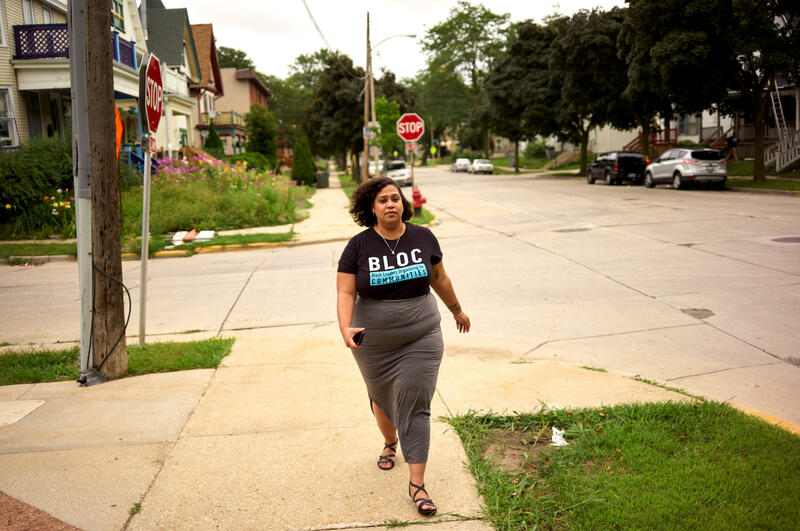 BLOC, a community based group works in Milwaukee neighborhoods with a purpose of uniting and informing its citizens of current issues along with political insight to better their community. 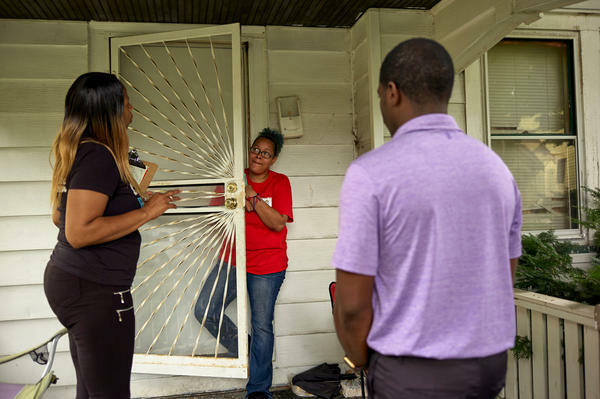 Wisconsin State Rep. David Crowley, right, works with Keisha Robinson, not pictured, of BLOC, Black Leaders Organizing for Communities as he takes part in a silent canvass where Crowley is only allowed to listen to community members like Chrystal Edwards, left, Aug. 7, 2018 Milwaukee. Angela Lang, left, executive director of BLOC, Black Leaders Organizing for Communities walks back to the organizations headquarters, Aug. 7, 2018 Milwaukee. Wisconsin State Rep. David Crowley, right, works with Keisha Robinson, left, of BLOC, Black Leaders Organizing for Communities as he takes part in a silent canvass where Mr. Crowley is only allowed to listen to community members like Quiana Jasper, center, Aug. 7, 2018 Milwaukee. Wisconsin State Rep. David Crowley, left, works with Keisha Robinson, right, of BLOC, Black Leaders Organizing for Communities as he takes part in a silent canvass where Mr. Crowley is only allowed to listen to community members like George McBeth, center, Aug. 8, 2018 Milwaukee. Wisconsin is one of three states — Michigan and Pennsylvania included — that was critical in securing Donald Trump's 2016 victory, according to analysts. But experts and organizers say that if Democrats there want to oust Republican Gov. Scott Walker and re-elect Democratic Sen. Tammy Baldwin in November, they'll have to repair their alliance with a critical demographic that sat out during the last November election. "There is no way to win a statewide election without the city of Milwaukee, which is specifically black folks," say Angela Lang, a political activist. Lang is at the forefront of a movement to mobilize those African-American voters in Wisconsin's biggest city. In 2016, African-American turnout nationally dropped for the first time in decades. In Wisconsin, it fell by almost 20 percent. Most African-American Wisconsinites live in Milwaukee, which means it is there that the frayed relationship between the party and black voters will have to be rebuilt. Milwaukee is one of America's most segregated cities, and African-Americans there face sky-high incarceration rates, strained relationships with police and inequalities in education. The city's west side is one of the areas with a majority-black population. "I think this neighborhood is a place that's kind of forgotten," says Lang, a charismatic 29-year old African-American who grew up in this part of town. It is also where she founded her organization BLOC — Black Leaders Organizing for Communities. Lang says she knows the racist stereotypes politicians often ascribe to her city. "A lot of people think that Milwaukee is just full of murder and mayhem, which is quite literally what the state representative said some years ago," Lang says. It was a Republican lawmaker who made that claim, but Lang says Democrats made their own assumptions in 2016. "People take for granted the black vote," Lang says. "People just assume black people turn out for Obama, they're Democrats, they're going to automatically turn out [in 2016], and it wasn't the case." Election experts have noted that gerrymandering and strict voter ID laws suppressed African-American votes in Wisconsin in 2016. Lang, however, is quick to point out that is not the whole story. "What I saw [in 2016] was people not being apathetic, but people choosing to not vote and using that as their power, as their political power, which was I think the first time I've ever really seen that," Lang says. She admonishes Democrats for blaming their 2016 losses on African-Americans, while failing to run candidates better suited to win the trust of black communities. Lang tries to reframe the question of voter turnout by asking, "How about we had a candidate that actually earned our votes?" She founded BLOC in 2016 to help answer to that question. Lang says civic engagement for Milwaukee's African-American residents must be a two-way street: the challenge being both to get black voters re-engaged in politics, and Democratic candidates to engage more meaningfully with the community. "People go to certain black churches, they go to certain black restaurants, they go to black barbershops," Lang says, describing a common checklist of Milwaukee political photo-ops. "Like 'OK, I did my little black Milwaukee tour.' "
Superficial engagement won't help underserved neighborhoods in Milwaukee, Lang says, nor will it energize black voters. So rather than accept the status quo, Lang and BLOC have come up with a novel way to change time-worn campaign dynamics — they call it a "silent canvass." Lang says that if voters know anything about politicians, it's that they're constantly talking about themselves — their story, their campaign, their talking points. BLOC's "silent canvass" asks them to do the opposite and simply listen. As Wisconsin State Rep. David Crowley joked recently, "It forces me to shut up." Crowley, a Democrat, is one of more than a dozen elected officials who've been taken through the exercise. 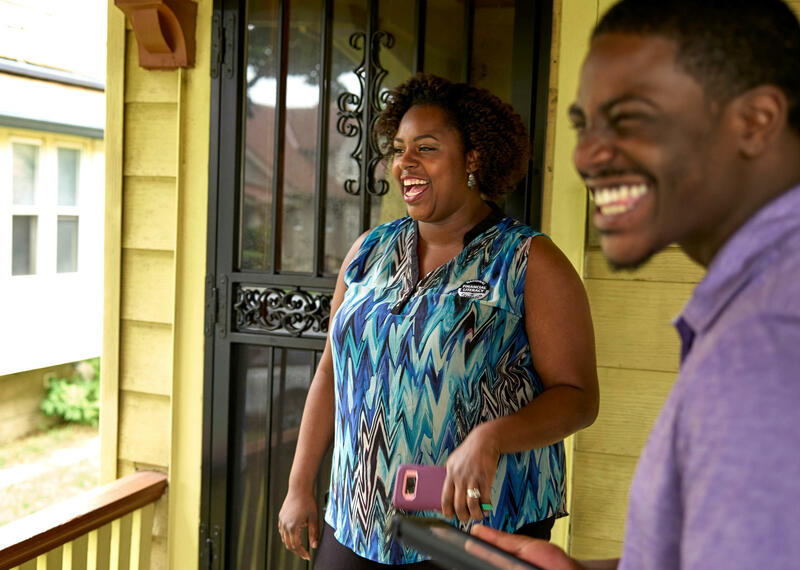 The premise is simple: When a BLOC organizer and a politician head out into a neighborhood to go door-to-door, the organizer introduces the politician not by their title, but as their friend, first name only. The organizer talks to the resident about neighborhood problems and upcoming elections, while the politician — who pledges to stay silent — stands quietly to the side, hearing an unvarnished take on the ups and downs of daily life. After a mock "silent canvass" in BLOC's basement office, Crowley and BLOC organizer Keisha Robinson drive to Milwaukee's north side to start knocking on doors in one of the most economically depressed parts of the city. It's a neighborhood of detached homes with wooden porches and lawns, some well-tended and others strewn with children's toys and debris. In many ways, the "silent canvass" goes the way an old-fashioned canvass would: wary residents look out from behind barred doors; some people don't answer the door, others aren't interested in talking. But Robinson does connect with a few people, like Avis Landrum. Robinson catches the middle-aged woman between her car and her front door, but Landrum is willing to share some of her concerns about the neighborhood: abandoned buildings, potholes, the careless renters next door. Since Robinson and the other organizers BLOC hires come from the parts of the city they're working in, they often have a personal understanding of the problems. Robinson asks Landrum about a spate of recent shootings, and they also talk about a bar that's notorious for its rowdy clientele. Down the street, Johnny Ewell answers Robinson's knock. He tells her he was the second African-American in the area when he moved into his home more than 50 years ago. While Crowley listens in, Ewell describes a neighborhood that has seen cycles of violence come and go and come back again. "We're losing too many of our young folks," Ewell says, as Robinson nods. "That's bad, that's really bad." Robinson follows BLOC's script, asking Ewell and others about what changes they would like to see in their neighborhood, and at every door, she asks people if they are going to vote — Ewell and Landrum said they would — and hands out a flyers about a candidate her organization has endorsed. 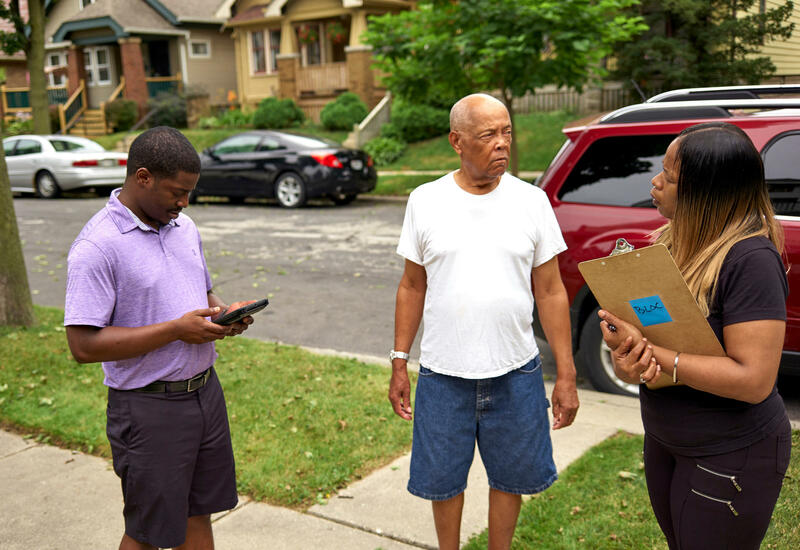 In the weeks leading up to this past week's primary, BLOC organizers knocked on more than 18,000 Milwaukee doors. While they have yet to determine what impact they had on voter turnout this time, Lang says that their "silent canvass" outreach has been working: in a recent local race, they say black turnout in the parts of the city they targeted went up by 3 percent. And this week, Milwaukee County's unofficial tally shows that voter turnout in Ewell and Landrum's ward was 14 percentage points higher than in the 2016 primary. But Robinson says it continues to be an uphill battle to mobilize people who have felt neglected for so long. "You see the defeat on some people," she says. "I get this a lot from the older people, they'll congratulate us and tell us they admire the fight, but they're done. And to see that is kind of heartbreaking because it's like, where is the hope?" Reviving that hope may make the difference for Wisconsin Democrats in November.